Pianist Gail Olszewski and I are performing our concert for a third time, this time in downtown Minneapolis! 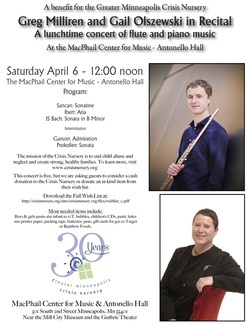 Please join us for a lunchtime concert of flute and piano music at the MacPhail Center for Music in Antonello Hall on Saturday, April 6th at 12 noon. This concert also serves as a benefit for The Greater Minneapolis Crisis Nursery. Their mission is to end child abuse and neglect, and create strong, healthy families. The concert is free, but we ask that you either make a cash contribution to the Crisis Nursery at the event, or donate an in-kind item from their Wish List. It has been a little over two months, as of this writing, since the lockout began on October 1st. I will not say much in detail about it here, except that you can obviously guess that it has affected my life and the life of my colleagues greatly. Despite whatever you may read in the media and putting aside all cynicism about these sorts of things, the musicians truly do want a resolution to this situation as soon as possible. The Gala Concert we performed at the Convention Center in October was one of the most powerful musical experiences of my life and served as a poignant reminder of what a truly special orchestra this is. It really is a feather in the cap for the State of Minnesota and the musicians' number one goal is to make sure that tradition is preserved. If there is a way, we will find it. Please take the time to visit the musician's website and our facebook page. We need everyone's help to bring this lockout to an end. Our audiences are de facto locked out too, after all. There is much being written in the blogosphere about this situation. The links to most of these can be found on the musicians website as well, under the News tab > Press Links. One reason I love to be a professional musician! Last week I visited the Friends School where my buddy Chad teaches 3rd and 4th grade. Chad was doing a unit on sound and acoustics with his kids this year, and asked me to come in to talk to his kids about how the flute works and about being a professional musician. I've done lots of presentations for kids before, and I usually play The Great Train Race by Ian Clarke, a contemporary flute work that uses extended techniques almost exclusively to create the effect of a choo-choo train racing down the tracks at high speed. 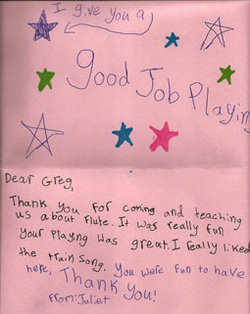 Kids (and adults, I might add) really love the piece, which is why I play it at school presentations. It was great fun, and Chad's class was really engaged and excited to learn, which made them easy to talk to. I almost always receive a thank-you card from the class and the teacher, but rarely have I received as many cards in the mail from the kids as I did this time, like the one from Juliet pictured here. It was like a warm hug to get a giant envelope stuffed with tons of hand-drawn cards, and it reminded me why sharing the gift of music is such a special powerful experience. The pressures of being a professional musician can at times really run you down, despite the many joys of music-making. But thanks to the 3rd and 4th grade classes at the Friends School I'm feeling cheerfully revitalized! Welcome to my updated website! Greetings, folks! Welcome to the NEW gregmilliren.com. I'll list recent news and events here, as well as post thoughts from time to time.